A large erratic stone set beside a public foot path. The stone is subject to local legends, including the allegations that it bleeds, that birds cannot be heard singing near it and that treasure is buried beneath it. A large erratic stone rests at this location. Tom Martin referred to is as the great stone of Lyng in about 1730 (S2). 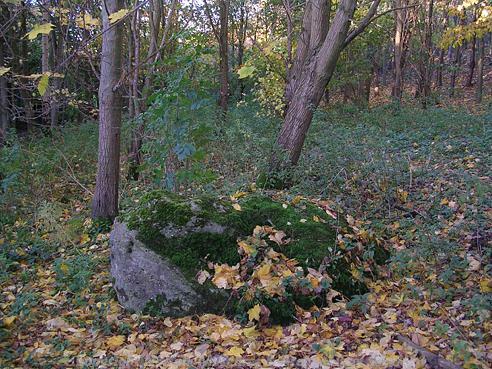 The stone is set beside the public footpath, on the west, in a deep gulley in woodland. It is a toad shaped stone about 2m long by 1.5m thick and wide, formed of some sort of layered conglomerate. Grid references were corrected on the ground. E. Rose (NLA), 28 November 1994. Local legend states that birds cannot be heard singing in the vicinity of the stone. This was proved to be untrue by E. Rose (NLA). Description otherwise remains the same. E. Rose (NLA), 4 April 2005. Local legends about the stone include that it bleeds and there is treasure buried beneath it. D. Gurney (NLA), 12 April 2005. <S1> Newspaper Article: Eastern Daily Press. 1939. The King's Grove, Lyng. A Giant Boulder and its Legends. 13 March. <S2> Unpublished document: Martin, T.. 1772. Church Notes.